Two potatoes well-seasoned with chili powder, cinnamon, pepper, and garlic for a burst of spicy flavor. 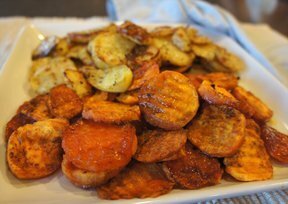 Roasted together these potatoes make the perfect side dish for any meal. A great recipe to use for this fall's harvest of potatoes. Step-by-step instructions on how to clean a head of cauliflower and remove the florets. Learn how to clean Brussels sprouts and how to prepare them before cooking.